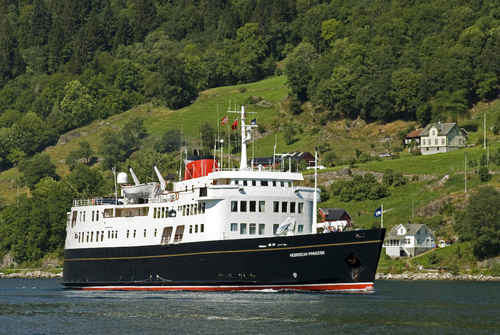 Mike samples Hebridean Princess, twice chosen by Her Majesty the Queen to sail around the Scottish Islands. The old saying, “don’t judge a book by its cover” was a phrase that sprang to mind as we disembarked from Hebridean Princess. When you think of a luxury cruise liner, this is probably not the image that would spring to mind. Unlike today’s sleek modern monsters of the sea, this converted Scottish car ferry wouldn’t win any beauty parade. Yet this is the ship that the Queen has twice chosen to cruise the western Isles of Scotland, the first time as part of her 80th birthday celebrations. Once you negotiate the narrow but secure gangway and board the ship you begin to realise just why. A few months previously we had been aboard Royal Caribbean's Freedom of the Seas. On that trip there were around 4,200 passengers and 1,900 crew. 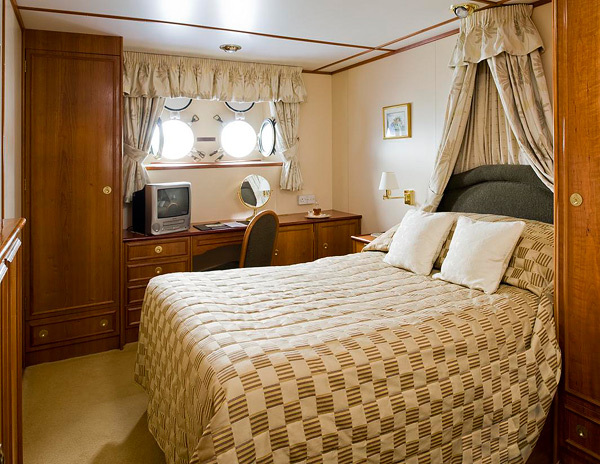 Hebridean Princess, however, provides a luxurious yet relaxed and intimate atmosphere for just 50 passengers and 38 crew. Eleven cabins are appointed for single guests and this must count as the most sociable cruise ship there is. Someone described it as a country house party at sea and this seems an accurate description, not just of the size and ambience but also the accommodation, catering and service; top class certainly, but definitely not formal, stuffy or intimidating. The first thing we noticed on reaching our stateroom was the size of the bathroom. 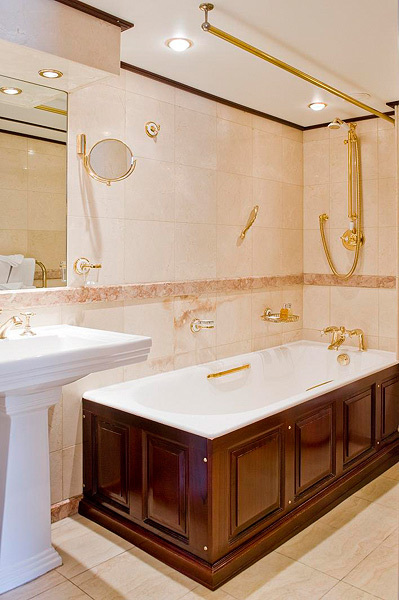 In most cruise ships you might have only a shower; any baths tend to be modest in size. We, on the other hand, had a full size bath in a huge and luxurious bathroom. The bedroom too gave an atmosphere of a country house, furnished in luxurious traditional style. Clearly no ordinary cruise ship this. Soon it was time for pre-dinner drinks and guests began arriving in the lounge. 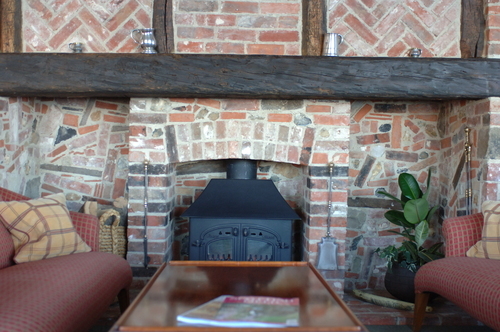 The public rooms continue the country house feel. The chairs and tables in the lounge are just like ones you might find in someone’s comfortably-furnished home. Binoculars for passenger use were dotted about on various window ledges. 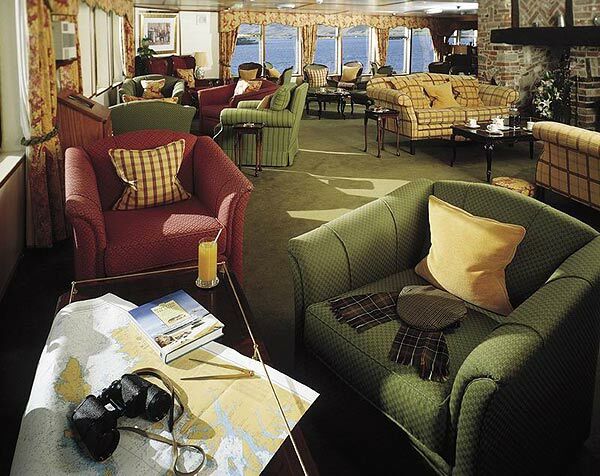 Surely this must be the only cruise ship afloat with a hearth and fireplace, not that the crew are allowed light a fire of course, but retaining it simply underlines just how different this ship is. As we entered the lounge a waitress appeared with two glasses of Champagne on a silver tray and we remembered that is an all-inclusive cruise ship. Even tipping is actively discouraged. Nor was there any skimping on quality and quantity, even the nibbles and hors d’ouvres were remarkable. We chatted amiably to the other guests, the flow of conversation aided by the flow of drinks, our glasses regularly topped up by discrete but attentive staff. It seemed a shame to move on, but dinner was ready and we all trooped off to the elegant dining room for a five course meal with a different wine available for each course. The food was top class and beautifully served. Being a Scottish ship it was only reasonable that one course was dedicated to haggis. The haggis was piped in and the ship’s Master made the time-honoured formal address to the haggis before stabbing it in the traditional manner. Although most of the guests were not familiar with this Scottish dish, they gave it a try and were instant converts; it was certainly the best haggis I have tasted. I think a few English hearts and minds were won over that night. After dinner we returned to the lounge for coffee, liquers and to continue the many conversations that had been started earlier. It was rumoured that the piper was on deck. Now I admit I was a keen amateur musician in my younger days and had always wanted to try playing the bagpipes, so I grabbed the opportunity to give it a go. Apparently I did well for a first-timer, not only getting the drones going but also getting some notes from the chanter. However, out or respect for those within earshot who were perhaps trying to get some sleep, I called it a day after this one attempt. 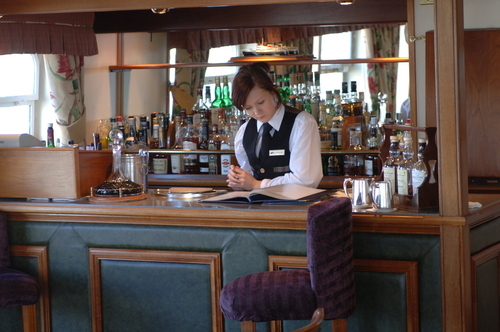 The ship’s itinerary covers primarily the Scottish Isles and mainland with the occasional foray to Ireland, the Channel Isles and the Port of London. After all a visit to the Tower of London seems only fitting. Walking guides are provided where appropriate and there are plenty of bicycles aboard for those who want to explore further afield on the ports of call. Wherever you go, however, you know that you have a comfortable and luxurious base to go back to. Of course, luxury and personal service at this level do not come cheap but you need to bear in mind that everything is included except, perhaps, the bagpipe lessons. But then I’ll not argue about that.